The Paley Center for Media in Beverly Hills is honoring the 100th birthday of Spike Jones. 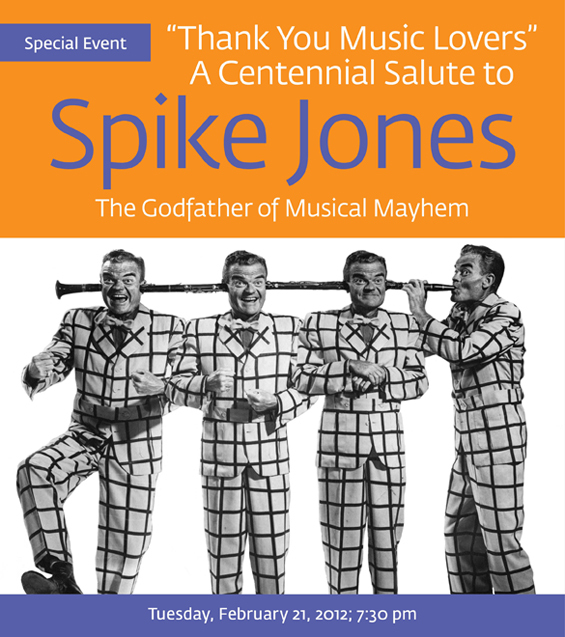 The centennial salute to Spike Jones is scheduled for Tuesday, February 21st at 7:30p. Free tickets for Paley members and the public are available this Wednesday at noon. Spike Jones invented and then defined an innovative blend of comedy and music. In celebration of the centennial anniversary of his birth, the Paley Center gathers a panel of family members, colleagues, and admirers, moderated by musical historian Dr. Demento, to salute this entertainment groundbreaker. The music of Spike Jones and His City Slickers, and his film, television and radio appearances will be remembered. Jones died in 1965 of emphysema. The bandleader’s son is expected to be on the panel. This entry was posted on Monday, February 6th, 2012 at 12:28 pm	and is filed under Blog by Manny Pacheco. You can follow any comments to this post through the RSS 2.0 feed. Responses are currently closed, but you can trackback from your own site.